In an era where online communication has come to be dominated by digital platforms YouTube, Facebook and Twitter, media organizations are under pressure to increasingly utilize those platforms as part of their content strategies, even as they compete alongside them for consumers’ attention and clicks. All three platforms have rolled out live streaming functionality to the masses in the past two years as each competes for a larger share of the seemingly limitless appetite for online video. 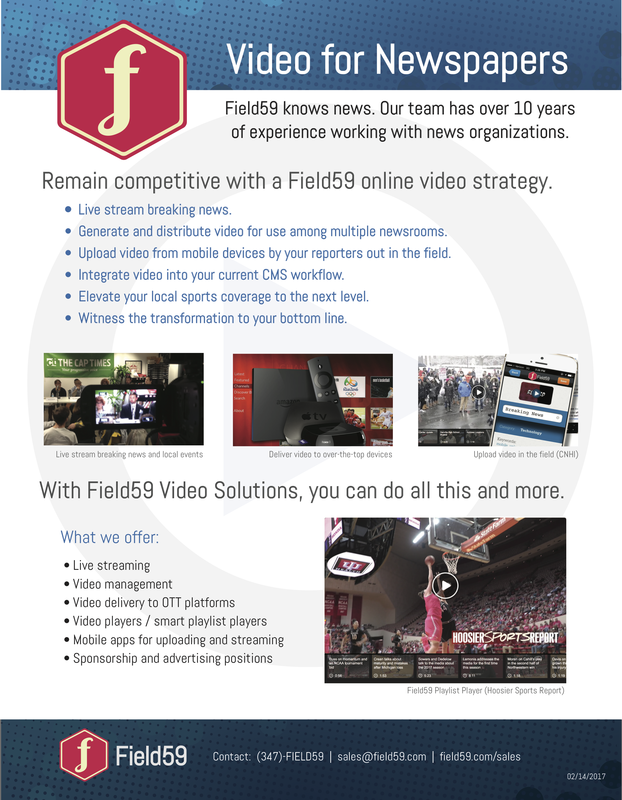 At Field59, we’ve embraced this trend by offering the ability to stream to YouTube Live, Facebook Live, and Twitter alongside our own live streaming and recording features through our video manager and player. Your page followers get automatically notified (as long as they don’t have notifications disabled). This is a great feature that can really drive viewership. 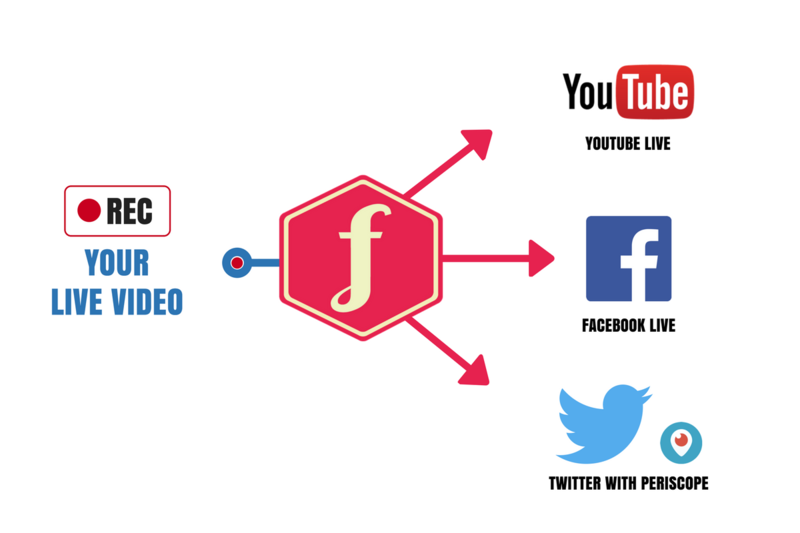 Facebook’s News Feed algorithm gives preference to live video over other types of content, so live streaming will maximize your reach over other types of content you might post to your followers. By virtue of Facebook being the biggest platform, having now surpassed two billion monthly users, it’s likely this is where your biggest audience is (depending on how you’ve focused your social media branding efforts). You can embed the Facebook player for your live event on your website — just copy the iframe code from the live player. Facebook displays this message when you create a live event: “Don’t put third-party video ads in your live video. For example, don’t include bumpers, pre-roll, mid-roll or post-roll”. It’s unclear how Facebook enforces this, but we advise adhering to this policy to keep your Facebook page in good standing. If you plan to generate revenue on your live stream by inserting ads at the source (by switching in content using a system like Newtek Tricaster), consider how this policy from Facebook could impact your business decisions. Facebook’s publish points are single-use. So unlike YouTube and Twitter, where we can set up your Field59 account one time and then stream to the same publish points from then on, Facebook requires you to update your publish URLs with every event. (This isn’t a problem for us, just send your credentials to Field59 and we’ll quickly get it updated for you). If your stream is interrupted due to an Internet issue at the source, you must create a new Facebook event and generate a new key — the platform is not tolerant of any hiccups in stream delivery. At this time Field59 hasn’t integrated with the Facebook Live API, but if we decide to in the future — for example, if we built controls to start your Facebook stream within the Field59 manager — then we (or any other platform you may use) could be limited in how your stream is published because Facebook’s policy for API use does not allow you to also distribute a live stream on other third-party platforms that you don’t own. However, because we are not using the Facebook API in our current workflow, we can help you simulcast on other platforms. Like Facebook, YouTube offers some attractive options for your viewers as well. Channel subscribers can receive notifications and emails. It’s not as robust as Facebook’s notifications — people probably spend more time logged in to Facebook than YouTube — but still gets the job done through emails and notifications to subscribers. You can, of course, easily embed your YouTube players on your own website. In a notable advantage over Facebook, YouTube will continue to try to stream (and record your stream) for as long as the YouTube event is active — meaning if your internet connection gets interrupted, you don’t have to create another event for your viewers. YouTube’s automated Content ID scanner technology is, to be blunt, rather aggressive, and even ambient music occurring at the event you are streaming could be sufficient to cause YouTube to take down your stream. This could be a significant hurdle if you are streaming in an environment with audio elements beyond your control. Any monetization of your live stream would be handled by YouTube, if you opt-in to their partner program. Although the initial setup sends you deep into Periscope settings, once that’s done, Periscope offers the easiest and most efficient process of the three for starting a live stream — just start your encoder, then in Periscope hit the preview button, compose your Tweet, and you’re on your way. Your Periscope live video is guaranteed to show up in all of your Twitter followers’ timelines like any other Tweet. Whereas Facebook may limit the audience for your post, you know that all of your Twitter followers will be exposed to your Tweet. Periscope does not appear to have the kinds of aggressive content scanning technology in place that would cause false positives if there’s music or other content in the environment that Facebook or YouTube might consider to be copyrighted. That efficient process for starting a stream is great for spur-of-the-moment streaming, but there’s no way to set up a scheduled stream in advance. Periscope’s stream diagnostics do not seem to be as tolerant compared to Facebook and YouTube. Periscope wants a lower bitrate, and is more particular about other settings such as audio bitrate and keyframes. It is more likely to prevent a stream from going out if things aren’t correctly set than Facebook and YouTube, which will give you warnings but not necessarily prevent you from streaming, even if the stream quality isn’t perfect. Fortunately, at Field59 we can overcome any Periscope warning issues by creating a specific stream output in our cloud that works for Periscope. Other than launching the player in the tweet in one click instead of two, it’s not clear that Periscope offers any significant advantage over tweeting out a link to a YouTube player of your live stream. Twitter does offer notifications, but users must opt-in to them, so they’re likely not commonly used.